Experience the bustling city of Hanoi, the mystic waters of the stretching Mekong Delta, the wonders to be found in Hue and the historic capital Ho Chi Minh. Enjoy an overnight river cruise in Halong Bay and discover the secrets of the Ben Tre river. In Cambodia, explore the legendary temples of Angkor Wat, an awe-inspiring UNESCO World Heritage site. International flights U.S. - Siem Reap, Ho Chi Minh - U.S. 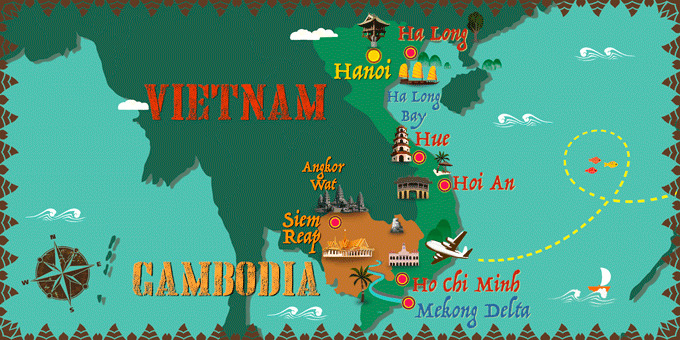 Domestic flights: Siem Reap - Hanoi - Danang, Hue - Ho Chi Minh*. 10 Breakfasts, 1 Brunch, 1 Lunch & 1 Dinner. Bottled mineral water in the car during the tour in Vietnam. *Documentation of the internal flights will be available in the "My bookings" section in your "Customer Area" 7 days after you have made your booking. Arrival at U.S. departure airport ready to check-in for overnight flight to Siem Reap. Continue your journey to Siem Reap. Upon landing in Siem Reap, you’re welcomed by our guide and check in to your hotel (Hotel check-in time is 2pm. Early check-in is not included). Overnight in Siem Reap. Breakfast at the hotel. Today explore the most significant temples in the Angkor Complex. Visit the ancient capital, Angkor Thom and enjoy the unique decorative towers of the Bayon Temple. At Preah Khan Temple, wonder at the 12th century splendor before you continue to Ta Prohm in the afternoon, home to the enormous iconic fig tree roots that grow through the middle of the temple. Admire Bayon architecture at Bantey Kdei temple before you finally arrive at Angkor Wat, the world heritage site and most revered of all the Cambodian temples. It features the longest bas-relief in the world and is the perfect place to watch the sunset over the entire temple complex. Overnight stay in Siem Reap. After breakfast, the day starts with visit to the complex dedicated to Ho Chi Minh- the nation’s founder, containing Ho Chi Minh’s Mausoleum (viewed from outside on Mondays, Fridays and every afternoons due to closure), and the house on stilts, One Pillar Pagoda. Next up visit Tran Quoc Pagoda - Hanoi’s oldest pagoda on the bank of West Lake & Temple of Literature, Vietnam’s first university which was constructed in 11th century. Then back to your hotel and free for lunch at your own expense. In the afternoon, take a cyclo ride around the Old Quarter streets which were named after the specific goods once offered for sale at these places. Stop at Hoan Kiem Lake to learn about the legend of the lake and visit Ngoc Son Temple, followed by the Water Puppet show - a uniquely Northern Vietnamese art form depicting scenes from rural life and episodes of national history. Overnight in Hanoi. After breakfast, meet our driver (no guide) and depart by road to Halong Bay, a World Heritage Area of outstanding natural beauty. Travel through the rich farmlands of the Red River Delta and the landscape of rice fields, see water buffalo and the daily life of the Vietnamese village. Arrive in Halong Bay and prepare to board a traditional junk boat. Lunch on board. The cruise passes by rocks and islets in many different shapes. The cruise will then stop for a while to visit the Surprising Cave. Later, the junk boat will move to a different dock for the night and dinner will be served on board. Overnight stay in Halong Bay. In the morning, your brunch will be served while doing another cruise to explore the beauties of the Bay before returning to the Wharf. The junk boat continues cruising toward Halong Port. Ready for disembarking. Our driver will be there to pick you up for Hanoi and to Noi Bai Airport for your flight to Danang. On arrival, you will be met by our guide and proceed 18.6 miles further to Hoi An. Check in your hotel and overnight in Hoi An. After breakfast, you will take a guided walk around the tiny town of Hoi An which stops at a 400 year–old Japanese Bridge, a 300 year-old Chinese temple, and a 200 year–old Vietnamese former merchants’ house. Afternoon is free at your leisure. We recommend to do the optional excursion to the rice paddy fields. * Overnight in Hoi An. After breakfast, you will be free in Hoi An until check out time. In the afternoon, you will travel along one of Vietnams most scenic highways to Hue. Stop on the way at the white sand of Lang Co Beach and the top of Hai Van Pass. On arrival you will be transferred to your hotel for check in. Overnight in Hue. After breakfast, you will visit the impressive home of the Nguyen Dynasty emperors (1820-1945), the Imperial City and the Royal Citadel. Much of the Citadel was destroyed during the Tet Offensive in 1968 but is gradually being restored. Continue by boat on the Perfume River to the Thien Mu Pagoda, Hue's oldest and most beautiful pagoda, thought to be the symbol of religion and spirit of the Hue people. After the visit, the car picks you up from there to the tomb of King Minh Mang. Lunch will be at your own expense followed by a visit to the tomb of King Khai Dinh. Overnight in Hue. After breakfast at the hotel, you will be transferred to the airport for a flight to Ho Chi Minh City. Upon arrival, you will be met by our guide and visit the War Remnants Museum which presents a partial, but riveting, view of the "American War", (as it is known in Vietnam). Continue to the Reunification Palace, the former residence of the Indochina Governor General and later President of the Republic of Southern Vietnam until the fall of Saigon in April 30, 1975. The tour finishes with Notre Dame Cathedral and the bustling Ben Thanh Market. Overnight in Ho Chi Minh City. Breakfast at the hotel. Enjoy a free day in this exciting city. We recommend an optional excursion to discover the magical Mekong Delta. * Overnight stay in Ho Chi Minh City. 16th Day: Arrival in U.S. Arrive back in the U.S. and end of your trip. After breakfast, meet our driver (no guide) and depart by road to Halong Bay, a World Heritage Area of outstanding natural beauty. Travel through the rich farmlands of the Red River Delta and the landscape of rice fields, see water buffalo and the daily life of the Vietnamese village. Arrive in Halong Bay and prepare to board a traditional junk boat. Lunch on board. The cruise passes by rocks and islets in many different shapes. The cruise will then stop for a while to visit the Surprising Cave. Later the junk boat will move to a different dock for the night and dinner will be served on board. Overnight stay in Halong Bay. All departures from the 1st January 2019 hotel in Ho Chi Mihn will be Grand hotel Saigon 5 star.